Well, obviously two big bombs got dropped today: The return of composer John Williams is official and we got our first look at the new cartoon, Star Wars Rebels. Kathleen Kennedy also talked about chatting with J.J. Abrams and using “every tool in the toolbox” for Episode VII, implying that we’ll be seeing a mix of CGI and practical effects. And yes, you can buy the Rebels logo t-shirt online. StarWars.com also live-blogged the Carrie Fisher event, and highlighted some fan stories. They also shared a video from yesterday with Warwick Davis, Doug Chiang and Iain McCaig. Newswatch! Sunday is by far the lightest day on the schedule, so those of us on this side of the pond may take the opportunity to sleep in, at least a little. There are still plenty of panels, but for our purposes I think we only need to keep an eye on two of them: Mark Hamill at 2:30 p.m. CEST (8:30 a.m. EDT) and the Closing Ceremonies at 4:00 p.m. CEST (10:00 a.m. EDT.) Will we learn the date and location of the next Celebration? As for the hoped-for Big 3 confirmation… If neither Kennedy or Fisher said anything, I doubt Hamill will, either. Next milestone is in two weeks at Disney’s D23 Expo, and the rumors have already been churning. Patience! 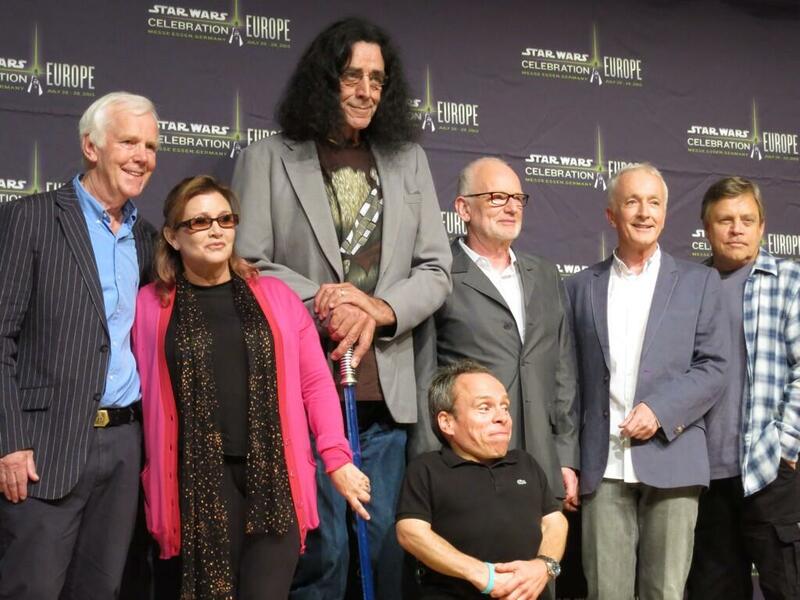 The second Celebration Europe – and our first Celebration of the post-Disney era – has officially begun with a press conference reuniting much of the Return of the Jedi cast. Luckily, Dan Brooks of StarWars.com live-blogged it. Don’t forget, our own @jamesjawa is in Germany, too! Roundup: Will Episode VII help diversify Star Wars? The blogside. It’s a hot button issue in many fandoms right now – just ask anyone hanging around Game of Thrones lately – and Bria at Tosche Station explains on why it’s important to have diversity in Star Wars. Oh, Carrie! Carrie Fisher shares some ideas for Episode VII. They are very… Carrie. Who wants in now? Star Wars alumni Warwick Davis, Samuel L. Jackson and Ray Park. Spinoffs for everyone? Disney business. Bob Iger will remain at the helm of Disney through at least 2016. And with The Lone Ranger’s opening-weekend belly flop, Disney has plenty of reasons to be thankful for their recent acquisitions. One expert expects Disney to net about $733M for 2015’s Episode VII alone. Warwick Davis on Doctor Who, and what’s coming for SF/F TV next season? Two J.J. Abrams pilots were picked up as well: Fox nabbed robot police drama Almost Human, while Fox picked up Believe, a collabration with Alfonso Cuarón about a telekinetic ten-year-old. It’s no big shock that The Vampire Diaries spinoff The Originals got picked up, but the CW also greenlit post-apocalyptic The 100, a remake of The Tomorrow People and the human/alien romance Star-Crossed. Meanwhile, in the cable realm, both SyFy’s Defiance and BBC America’s Orphan Black are getting second seasons. You can check out the full slate of pilots – picked up and passed over both – at The Hollywood Reporter. 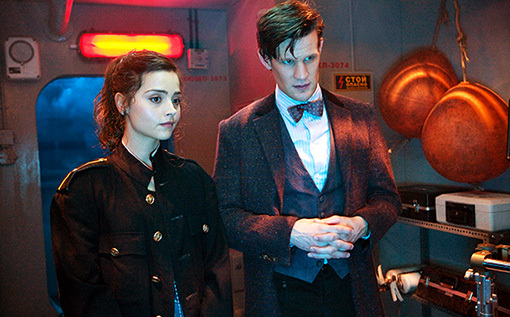 Video: It’s almost time for more Doctor Who! The show is back March 30th on both sides of the pond. It’s been a while since we checked in with progress on Celebration Europe, so here’s what’s been happening. Warwick Davis will be the con’s Celebrity Host, overseeing the “the show’s biggest events” and guests. Thus far only Dave Filoni has been confirmed, but there’s sure to be more big names on the way. And on that note, Pablo Hidalgo continues his wildly successful run as host of the Behind-The-Scenes Stage. They’ve also announced the art show lineup, which includes Joe Corroney, Hugh Fleming, Tsuneo Sanda, Chris Trevas and many more. And if you’re wondering, yes, it looks like there are still VIP tickets available. USA Today reports that a digitally restored version of Lucasfilm’s fantasy film Willow will be coming to DVD on March 12. 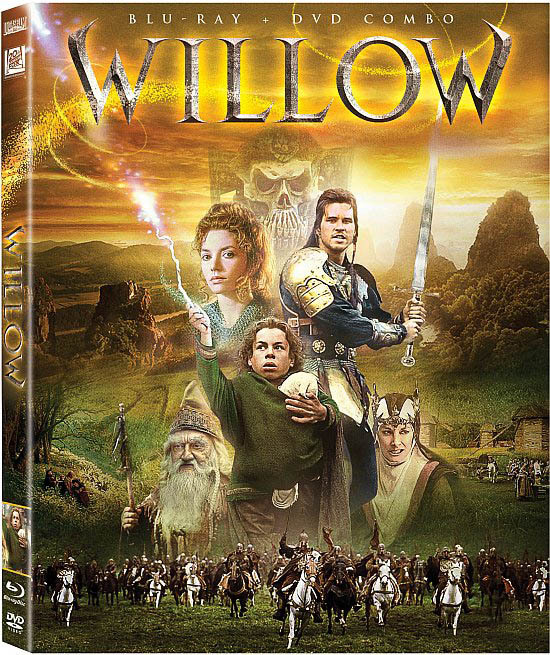 Willow was originally released in 1988. It was produced and written by George Lucas, directed by Ron Howard, and starred Warwick Davis, Val Kilmer, and Joanne Whalley. The Blu-ray will contain commentary from Howard, Davis’s own personal video diary, and and Dennis Muren’s “From Morf to Morphing: The Dawn of Digital Filmmaking” with a new intro. Anyone who thinks George Lucas might have issues with redheaded ladies working for evil empires should probably check this one out. Of course, as a child of the late 80’s, I admit I have a HUGE soft spot for this movie and will totally be buying it. Davis will appear in the current season’s penultimate episode, which was scripted by writer Neil Gaiman. Gaiman’s first Who episode, ‘The Doctor’s Wife,’ won a Hugo. Davis began his career playing Wicket in Return of the Jedi and has since appeared in The Phantom Menace and the Harry Potter films. His most recent role was starring as ‘himself’ in the sitcom Life’s Too Short. Doctor Who is currently on hiatus – the second half of the seventh season (or, yes, series if you’re going to Brit-pick) will start on Christmas and continue with eight episodes through the spring. That’s when we’ll see Davis’ episode. Pablo Hidalgo looks at Day 2 on the Behind the Scenes stage, which starts off with the Del Rey panel and ends with a tribute to Brian Daley. Also, Warwick Davis, Hasbro, the Ralph McQuarrie retrospective, and model making. You know where we’ll be next week! Not that Pablo says he expects the Del Rey panel to “be dominated by audience Q&A,” so start thinking up some good questions… I’ll have a few general Q&A tips early next week. And Aaron Allston has posted his signing and panel schedule. We got Zahn’s the other day. UPDATE: And here’s Del Rey’s full Celebration VI schedule.